Exterro®, Inc. is the preferred provider of e-discovery software specifically designed for in-house legal and IT teams at Global 2000 and AmLaw 200 organizations. Built on a simple concept of process optimization, Exterro helps organizations improve and simplify e-discovery activities. With Exterro’s Orchestrated E-Discovery Suite, traditionally fractured and fragmented e-discovery efforts are mended by orchestrating and automating tasks in a coordinated workflow across the entire e-discovery process, reducing time, cost and risk associated with e-discovery. For more information, visit www.exterro.com. Process improvements stem from two areas: education and lessons learned from on the job experience. 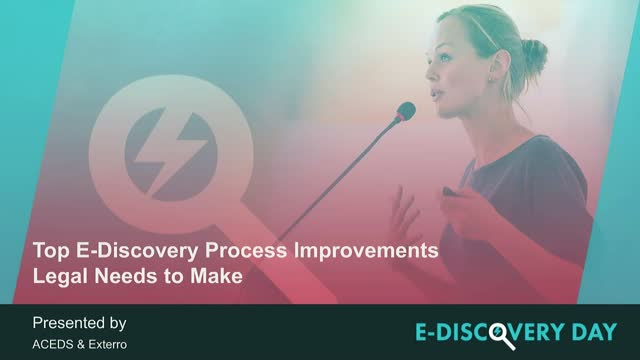 In this roundtable discussion, learn from three e-discovery experts, who are not only e-discovery teachers but also have navigated complex e-discovery projects, on what 5 e-discovery process improvements legal teams must make to start seeing real results. There’s a lot of noise out there when it comes to what’s hot or new in e-discovery technology. In this roundtable discussion, four e-discovery technology thought leaders will cut through the noise and identify what new e-discovery technology you should be paying attention to in 2018. Is it Malpractice Not to Get a FRE 502(d) Order? With so few cases going to trial, lawyers may be unaware of provisions in the Federal Rules of Evidence (FRE) that protect privilege during discovery. In this edTalk, Judge Peck will discuss why every lawyer should use FRE 502(d) in every case to prevent waiver of privilege. New e-discovery case law opinions and rulings can often provide the motivation that business and legal executives need to get additional resources for managing e-discovery activities. In this webcast, hear from one of the industry’s top e-discovery case law authorities, editor of the award-winning E-DiscoveryLaw.com case law blog, Bree Kelly, on what decisions you should be paying attention to and highlight when updating your legal strategy. You've heard about the new Federal Rules of Civil Procedure (FRCP) e-discovery amendments and to be honest, you're probably sick of hearing the normal, theoretical chatter about them. Moving beyond the classic FRCP talking points, three e-discovery savvy judges will discuss how your legal department can meet evolving e-discovery court requirements with practical advice. Blockchain? Legal project management? Artificial intelligence? GDRP? In this roundtable discussion, three e-discovery reporters will share what they are seeing as the big e-discovery stories from 2017 and how legal teams are responding. With only six months to coming into force, legal teams are left with serious GDPR questions in relation to US e-discovery activities. In this webcast our European panel, former Senior Master of the Queen's Bench Division, Steven Whitaker and Head of the International Sector Data Protection Unit at the European Commission, Ralf Sauer, will use a question and answer session to try to provide some guidance and advice on how to interpret the GDPR and stay compliant when this new Regulation becomes law. Learn about the different types of technology that automate some of the procedures outlined in part 1 and proactively safeguard employee data required for e‑discovery/compliance. Breaching the new EU General Data Protection Regulation (GDPR) regulation could amount to a massive financial penalty (up to 4% of the violating organization’s annual global revenue), resulting in hugely significant fines. Much of the compliance responsibility resides with corporate law departments correctly modifying their organization’s current e-discovery and information governance activities. In this on-demand webcast, learn the must-know e-discovery steps to meet GDPR compliance, along with best practices for making this transition as smooth and painless as possible. With all the news surrounding data breaches and information leaks, it’s often forgotten that the number one way sensitive/confidential information illegally enters the public domain is when employees leave their organization. In this webcast, learn about how technology can help prevent data from walking out your front door and proactively safeguard employee data required for e‑discovery/compliance.